The Glen Rock Hose & Ladder Co. has replaced all the fluorescent lights in both of our bays with LED lights. The fluorescent bulbs for the fixtures are no longer made, so the choice was made to replace them. The installation was done by the Electrician program at HACC-York Campus. We appreciate their help to keep the costs down. These lights have really brightened the bays and we hope it will cut our electricity bill. 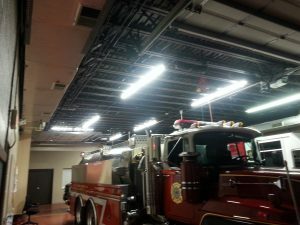 The goal is to replace all of the fluorescent lights with LEDs through out the station.